Mobile technology is an amazing thing. It’s one of the most revolutionary productivity tools of all time, but it doesn’t end there. You can use your smartphones and tablets to help teach yourself new skills and learn new things. Finding apps isn’t difficult. Finding education apps is only a bit more challenging. Finding free education apps is also possible. Finding free education apps worth downloading is a different story entirely. Here is one of our favorite free-to-use education apps that are worth a download. 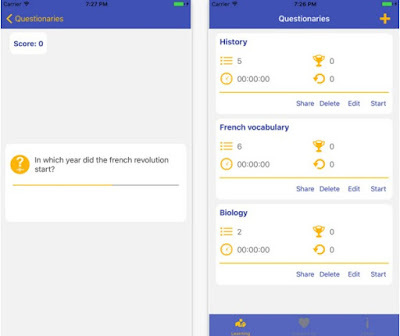 We present to you Speacher – a cross-platform educational tool for people that want to learn something new, for all of those that want to prepare themselves for a test or an exam, and even for teachers that have the desire to teach their students something useful. This digital teacher is compatible with both Android phones and tablets, and with both iPhones and iPads, but the best thing about it is that it’s free and easy to use. Speacher is based on the simple question and answer principle. All you got to do is answer your questions correctly, beat your own timing, keep track of your progress, categorize your questions into different questionnaires and make high scores. This way you’ll learn faster and you’ll stay more focused. Also, you can learn new languages and their whole vocabularies because the app supports multiple languages. Even if you have more than one upcoming exam in a short time you can split the work with friends and share your questionaries with each other. Rely on a high-quality source of learning material and prepare yourself in a better way by downloading the Speacher app from one of the following links.